This lesson will guide you through linking an assessment given in Illuminate to your Illuminate Gradebook. 3. Click on the title of the assessment. This will take you to the assessment Overview page. 4. From the Assessment Overview, click on the Administration tab. 5. Click Link to GradeBook. 6. What GradeBook are you linking to? 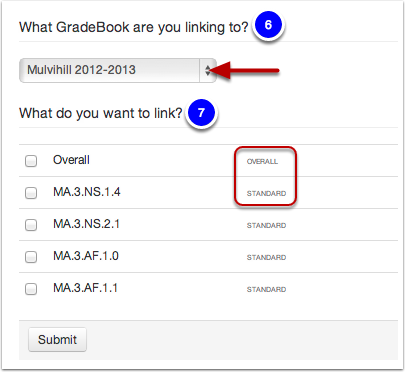 Select which of your gradebooks you would like to link this assessment to via the drop down menu. If more than one class period has taken the assessment, you will need to link each class individually. 7. What do you want to link? You may link the overall assessment score, standard scores, and/or question group scores. 8. 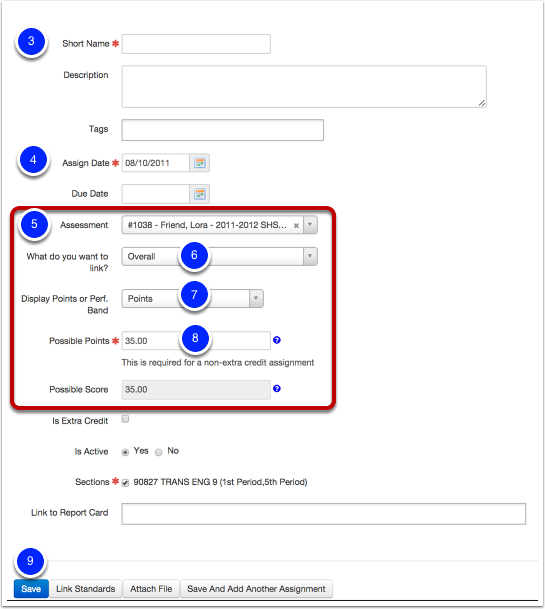 Create a new assignment - You will create individual assignments for the assessment overall score, and/or standard scores, and/or question group scores. This screenshot depicts an assignment using the overall score from an assessment (see below for one depicting an assignment created for a standard). - Total Score - The total score you would like to give this assignment (Total Points reflects what was set when you built the assessment for reference). Your Total Points and Total Score should match unless you are doing weighted scoring. 8. Continued - Create a New Assignment - for a standard- Same as above, other than you are creating an assignment for a particular standard. This is useful if your site is using standards based Report Cards. 9. Create and link Assignments - The assignments will be created in your gradebook and you will be taken back to the original linking page (What GradeBook are you linking to?) automatically. Go back and select a new GradeBook and Links - This will take you back to the original linking page (What GradeBook are you linking to? ), without creating the linking assignments. You will see a green banner across your page stating, "You have successfully linked: Title of exam & assignment" You will also see a blue 'linked' box next to all of the assessment/standards/question groups now linked in your gradebook. If you click on the 'linked' box it will take you immediately to the assignment in your gradebook. Access your GradeBook (GradeBook > GradeBook List > Click Title of GradeBook). 3. Give your assignment a name. 4. Select an Assign Date. 5. Chose an Assessment from the dropdown menu. 6. What do you want to link? Overall score, etc. 8. Possible Points/Score are automatically populated by the assessment information. 9. Once finished, click Save at the bottom of the page. All students scores will populate in the assignment automatically.